The biosphere is full of amazing plants and animals. How much does your 3rd graderknow about the other creatures on Earth? Use this printable 3rd grade science worksheet for as an extra science lesson. Have young learners take this fun quiz and find out how well-acquainted they are with their neighbors on earth! They can then spend time finding out more about the creatures that interest them. 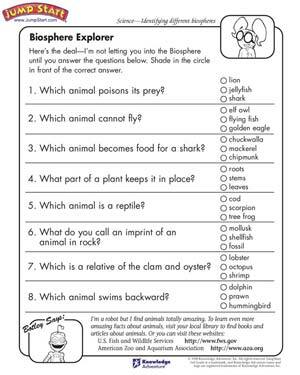 Also browse through other interesting science worksheets.